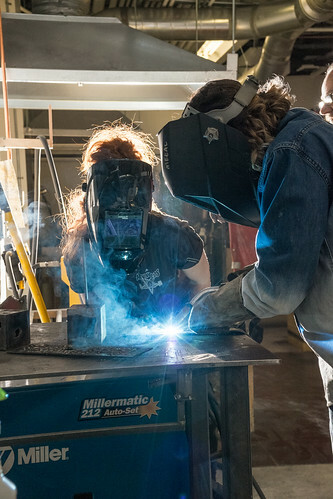 Welding for Artists and Makers covers creative applications of welding and broad technical knowledge in a supportive artist/maker environment. You will learn MIG (wire feed), oxy-acetylene (gas) and spot welding, pro fabrication tricks, heating and bending techniques, various patinas and finishes, and safe use of the cutting torch and plasma cutter. We will be working in mild steel and discussing various properties of hot and cold rolled material, and how to source what is needed for your projects. Jen Richardson-Greene is a certified welder as well as a sculptor with 15+ years experience working as a metal fabricator, artist, designer of metal furniture and architectural details, and patina specialist. All genders and those without previous shop experience are all equally encouraged and welcome. Jen Richardson-Greene is a sculptor and designer and teaches at PNCA as an Associate Professor in Foundations and in the Community Education and smARTworks programs. She recently was artist in residence for the Portland Children’s Museum in Botanical Sculpture, and has shown work nationally. This summer she will be also completing new work through a research and development fellowship from Form in Portland, OR.